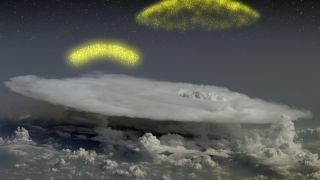 This NASA illustration is a still from an animation depicting how thunderstorms on Earth can create beams of antimatter particles and hurl them into space. SEATTLE – Powerful thunderstorms on Earth can fling beams of antimatter into space, a new study finds. Scientists picked up on the never-before-seen phenomenon by peering at thunderstorms with NASA's Fermi Gamma-ray Space Telescope. The antimatter particles were likely created by what scientists call a terrestrial gamma-ray flash (TGF), a brief burst of gamma rays produced inside thunderstorms and known to be associated with lightning, researchers said. "These signals are the first direct evidence that thunderstorms make antimatter particle beams," study lead author Michael Briggs, of the University of Alabama in Huntsville, said in a statement. Briggs presented his team's results here today (Jan. 10) at the 217th meeting of the American Astronomical Society in Seattle. "I think this is one of the most exciting discoveries in geoscience in a very long time," Duke University's Steven Cummer, who was not involved in the research, in a press conference. It "seems like something straight out of science fiction." This NASA graphic depicts the antimatter particle beam signal observed by NASA's Fermi Gamma-ray space observatory on Dec.14, 2009 from a terrestrial gamma-ray flash over Egypt. Fermi is designed to monitor gamma rays, the highest-energy form of light. When a piece of antimatter strikes the observatory and collides with "normal" matter, both particles immediately annihilate and are transformed into gamma rays — which Fermi can detect. The gamma-ray detector spotted the antimatter signals while searching for at terrestrial flashes of gamma rays. To date, scientists have identified 130 gamma-ray flashes from Earth since Fermi's launch in 2008, and four of them clearly show antimatter signatures, researchers said. Fermi was located immediately above a thunderstorm for most of the observed gamma-ray flashes, but in several cases, storms were far away. During one event, spotted on Dec. 14, 2009, Fermi was hovering over Egypt. But the active storm was in Zambia, some 2,800 miles (4,506 kilometers) to the south. The distant storm was below Fermi's horizon, so any gamma rays it produced could not have been detected. "Even though Fermi couldn't see the storm, the spacecraft nevertheless was magnetically connected to it," said Joseph Dwyer, of the Florida Institute of Technology. "The [terrestrial gamma-ray flash] produced high-speed electrons and positrons, which then rode up Earth's magnetic field to strike the spacecraft." Positrons and electrons annihilated each other, emitting gamma rays detected by Fermi's gamma-ray burst detector, researchers said. This NASA illustration shows how thunderstorms launch particle beams into space. The tops of thunderstorms harbor electric fields. Under the right conditions, scientists think, these fields can become strong enough that they drive an upward avalanche of electrons. When these electrons are deflected by molecules in the atmosphere, they emit gamma rays. Some of these gamma rays pass near atomic nuclei, in the process transforming into an electron and a positron, researchers said. It's these particles that reach Fermi's orbit. The revelation that thunderstorms can produce antimatter follows closely on the heels of the discovery that lightning can emit X-rays and gamma rays, researchers said. "Just a year or so ago, it wasn't at all obvious that something like this should happen," Dwyer said. Earth is likely not the only planet that boasts antimatter-generating storms, researchers said. "There's every reason to think the same processes are happening on other planets, such as Jupiter and Saturn," Dwyer said. But the storms on those gas giants generally occur deeper in their atmospheres, so their antimatter beams may not be able to escape into space, he added. Follow SPACE.com Senior Writer Mike Wall @michaeldwall for the latest from the 217th AAS American Astronomy Society meeting.